When citizens in Red Hook wanted to assure passage of a Community Preservation Fund to protect working farms, they turned to Scenic Hudson for help. When officials in Hudson sought expert advice about revitalizing their waterfront, they approached us. And in Yonkers, residents alarmed over the towering wall of skyscrapers planned for their city's shoreline flocked to meetings we hosted. Why Scenic Hudson? Because we are the environmental group with all the tools to get the job done right. Runaway growth threatens to overtake the valley faster than the invasive "mile-a-minute" weed. Reshaping or halting it is a complex challenge requiring innovative solutions. Our track record proves we're up to the task. Our specialists in urban planning, land acquisition, park design, ecological restoration and advocacy not only are award-winning experts, they also have a passion for connecting people with the river. That's why time after time they come up with creative alternatives that make even developers stop and take notice. We made strong progress in 2007. In cities where sprawling development was destined to choke shorelines, officials heeded our suggestions. New designs offer more places for residents to enjoy the river and will provide lasting economic gains. Exciting new parks are slated for villages where citizens previously had little or no access to the Hudson. Our own parks are becoming meccas for environmental education, both through our growing school-based programs and a greater array of family-related events. Farmers will keep growing healthy local produce in fields we have protected. And in Albany we fought for and secured legislation that helps communities check the surge of subdivisions promising added revenue but more often delivering higher taxes. Our work is far from finished. Developers' bulldozers still are poised to destroy scenic vistas, ecologically sensitive wetlands and more working farms. Looking forward, we've developed a multi-year campaign to save "the land that matters most." We're targeting 65,000 acres that are the crucible of the valley's cultural, ecological and spiritual values. At a cost of $500 million, Scenic Hudson can't do this alone. We plan to expand our collaboration with state and local government and other land trusts to achieve success. This is a hugely ambitious vision. But we're off to a spectacular start thanks to the generosity of Kathryn Wasserman Davis. Her $20 million bequest, pledged shortly after she turned 100, serves as an inspiring challenge to us all to preserve a Hudson River Valley that will be enjoyed for many centuries to come. 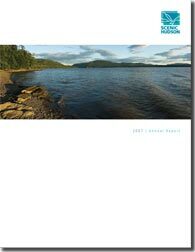 We invite you to download a complete copy of Scenic Hudson's 2007 Annual Report (PDF/2.6MB) This report includes a financial summary as well as supplemental pages with additional donors and volunteers. Scenic Hudson Forms 990 are available from Guidestar.org.